Over 90% of U.S. Shoppers (Consumers) Look Online FIRST via Their Mobile Device! Over 90% of All Mobile Local Searches Eventually Result in a Sale. During 2012, Over 50% (1.2 Trillion+) of ALL U.S. Retail Sales Were Influenced By Mobile. Yet, Less Than 10% of Boston Local Businesses Have a Fully-Optimized Mobile Website? 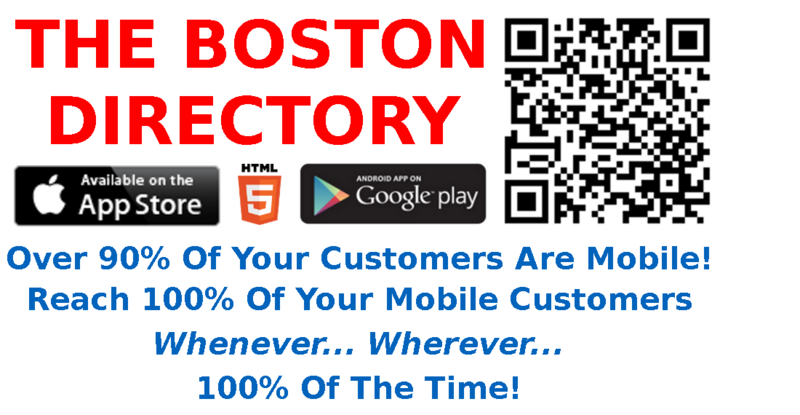 Yet, Over 90% of Boston Local Businesses Can NOT Be Found in a Mobile Local Search? Yet, Over 95% of Boston Local Businesses Do NOT Have Even a Mobile Presence? THE BOSTON DIRECTORY is a Boston Local Neighborhood Business Exclusively Assisting Boston Local Neighborhood Businesses to Effectively Harness the Power, Reach, and Value of Mobile to Exclusively, Competitively and Smartly Reach, Engage and Market to Our 1 Million+ Daily City of Boston Local Mobile Consumer Market Base 24 Hours a Day, 7 Days a Week in Full Alignment With Today's Consumer Lifestyle... Virtually No Matter Where on Earth They Are! THE BOSTON DIRECTORY will provide, create and host a full-color, multimedia-capable, social-active landing page in its BOSTON LOCAL apps and mobile website. Your mobile directory landing page will be designed to further encourage the consumers' visual reference of your business brand identity by maintaining the same online branding as both your website and mobile website. By providing direct access to your organization's phone, online and social media assets, your BOSTON LOCAL mobile marketing directory landing page instantly becomes your organization's central mobile consumer communications, engagement and marketing platform. The BOSTON LOCAL apps (iPhone, iPad, iPod Touch, Android) and mobile website positions your marketing assets and communication channels to reach virtually every mobile consumer 24 hours a day, 7 days a week. Because BOSTON LOCAL is 100% mobile, it propels your marketing to wherever your exiting and potential customers are; virtually anywhere in the world. Oh... and because BOSTON LOCAL is a marketing environment that is exclusive to the City of Boston local neighborhood business community, your marketing ads, eCoupons, Loyalty eCard Programs and eCirculars (that's right... weekly sales eCirculars and coupon eCirculars) can reach over 90% of your entire Boston local consumer market 24x7 with no outside competition.